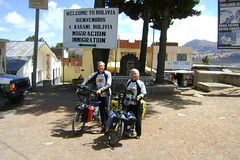 We entered Bolivia today. We asked cyclists already in the country whether they were sensing any unrest or finding any problems, and none of them were. So we decided to head on in. And even the news shows that all the issues have been in the eastern part of the country, which was far from our route anyway. The one hurdle we had to cross that we haven't anywhere else on our trip: We had to get a visa! There was a gob of paperwork and $135/person to be paid for the privilege. Bolivia started this program (exclusively for US citizens) several months ago in the interest of "reciprocity". It only makes sense. If Bolivian citizens want to go the US, they have to jump through all these hoops (and far more, really). And we knew about this hurdle for many months. We had thought we could get the visa cheaper ($100) Bolivian consulate at the last city in Peru, Puno, but when we showed up at their doorstep they told us they were out of visas and didn't know when they'd come. For other cyclists, our friend Andrew wrote a great article about how US cyclists get a Bolivian visa.